Do you need glasses? It can be overwhelming based on the tons of options out there. You may not even like wearing your glasses because you don’t like how they look on you, but you might just need the right pair for your face shape! There are different types, sizes and even colors. So how do you make an educated decision? Consider what will look best on your face shape. First determine what face shape you have and then choose your favorite style. If you have a round face, this means your face has the same width as length and no corners at the jaw. 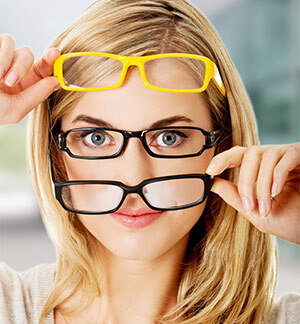 You’ll want to choose a square or rectangle-shaped style frame. This will create a contrast between your face and the frame. Sharp edges can add definition and highlight your bone structure. If you feel bold, try a cat eye frame style! If you have an oval face, this means your face is longer than it is wide and it also means the widths of your brow, cheekbones and jaw are almost equal. You can pull off a range of styles including a flat-top frame or rimless. You can also pull off bold colors or textures. You can really pick anything you want! If you have a heart-shaped face, this means you have an inverted triangle face. Your face is wider at the top and narrows towards the jawline. You’ll want to pick a frame that mimics your features like a wider, oversized frame. It can help fill out your face and draw attention to your eyes instead of your jaw. If you have a square face, this means the width of your forehead, cheekbones and jaw are pretty much the same. You’ll want to aim for a style that contrasts your face shape like a round or oval shaped lens. It can balance the sharpness of a square-shaped face. A gentle cat eye frame can also do the trick. If you have a diamond-shaped face, this means your face is longer than it is wide and you have wider cheekbones. You also have a narrow chin and forehead. Try frames that are round or oval with soft lines. Make sure your frames aren’t wider than your cheekbones. If you’re unsure, ask your eye doctor which styles will look best with your face shape and have them offer suggestions based on frame style and your price range. Eye doctor offices now often offer deals that allow you to buy a few pairs for a discount so you can experiment with different styles and colors. There are also now several websites that allow you to upload your photo and try on different pairs of glasses before you go in the store or commit to buying. There are also websites that send you glasses to try on in the comfort of your own home and you can return any that you don’t like. It is easy to find glasses that you love and that fit you well these days! Which face shape do you have? Do you wear glasses? Have you ever thought to pick glasses based on your specific face shape? Share your story with us!